Truck builder Kenworth is jumping into the hydrogen fuel cell race with a Class 8 drayage truck it expects to launch by the end of this year, the company said Tuesday. The announcement comes less than two weeks after Toyota Motor Co. unveiled a hydrogen fuel cell drayage truck of its own – a truck that used a Kenworth chassis as its base. Such trucks are used to shuttle shipping containers at ports and to distribution centers. Kenworth’s fuel cell project was part of a package of low- and zero-emission drayage truck programs the company announced during the Advanced Clean Transportation Expo taking place this week in Long Beach, Calif. In all, Kenworth said it will build the fuel cell truck and five Class 8 natural gas-electric hybrid drayage trucks for use in test programs hauling freight to Los Angeles-area warehouses from the Ports of Los Angeles and Long Beach. The ports are two of the nation’s busiest shipping facilities and are heavily impacted by poor air quality, as is the entire Southern California basin. Kenworth, a division of Paccar, and other truck and truck engine manufacturers are pursuing low- and zero-emission products in order to help trucking companies meet California’s tough air quality regulations. The green technology is an alternative to diesel engines that also are subject to increasingly stringent federal emissions standards. “Within the next decade, hybrid-electric powertrains are expected to be required to satisfy emissions regulations in several major U.S. metropolitan areas,” said Patrick Dean, Kenworth’s senior engineer. A fuel cell electric truck is considered a type of hybrid. Many projects such as those announced by Kenworth are funded in large part with grants from California air quality regulators as well as from the federal Department of Energy. 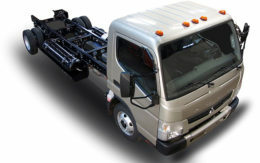 While Toyota’s prototype Class 8 fuel cell drayage truck used one of Kenworth’s extended-length chassis, the projects are not related. Toyota has developed its own fuel cell system. If both companies decide there is a commercial market for such trucks, Toyota could turn to its Hino truck-building unit for production and compete directly with Kenworth. In addition to the Toyota fuel cell truck program, others now in the works include a just-announced project by UPS to field 17 fuel cell electric Class 6 delivery vans by the end of 2018. The UPS hydrogen vans all will be deployed in California. Separately, Salt Lake City-based start-up Nikola Motor has said it will build and market a Class 8 long-haul tractor that will use a hydrogen fuel cell electric powertrain. Long-haul capability will be made possible by a nationwide network of Nikola-built hydrogen fueling stations, according to the company. Nikola said it will build its own manufacturing facility and that its first prototype truck will be ready in 2019. Electric vehicle manufacturer BYD also is using federal and state funding to help finance a small fleet of Class 8 battery-electric yard trucks it is building for California ports and other freight handling facilities. BYD is using the ACT Expo this week to showcase one of those yard trucks as well as a Class 8 battery-electric refuse truck it has developed and begun marketing. Kenworth said its fuel cell project and a companion natural gas-electric hybrid drayage truck project will be funded by $4.2 million in Department of Energy funding from a previously announced $9 million package of government grants for low- and zero-emission truck development. The company said it is using the remaining $4.8 million, from California air regulators, to help finance a companion project to build four additional low-emission natural gas-electric hybrid drayage trucks. All of the trucks will be built on Kenworth’s T680 chassis day cab chassis. Each truck will be capable of traveling up to 30 miles on electricity stored in its lithium-ion batteries before relying on the advanced powertrains – the fuel cell system or the natural gas engine – to complete a full day of regional hauling work, Kenworth said. 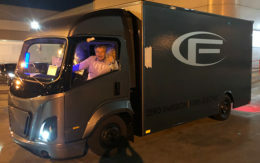 The fuel cell truck will use a system developed by Canadian fuel cell pioneer Ballard Power Systems. The fuel cell stack will produce electricity from hydrogen and oxygen to charge the batteries that will send power to the truck’s electric motor. The truck will use an electronic four-speed transmission. All of the natural gas hybrid trucks will use the Cummins Westport ISL G Near-Zero NOx compressed natural gas engine that was introduced last year. Kenworth said the initial natural gas hybrid drayage truck will be deployed in 2018. 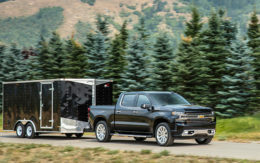 The company has been operating a similar truck under a different program this year and said it will use data developed in that test to refine the 2018 truck. The cost savings would have to be Hugh to make company’s spend that money. The Goverment could subsidize the cost under a new invirormental law with a ten year write down on emissions not produced,vehicle depreciation,interest write off and mandatory scrapping of delivery trucks past a certain year for producing harmful emisions . Owners don’t like it ,To Bad. They will get over it in time.